Christmas Dinner Menus - festive, delicious, the low glycemic way. Christmas dinner menus ought to be festive, delicious and not cause your blood sugar to go gyrating off the scale. That leads to fat storage. Here at Lifetime Fat Loss Christmas dinners are healthy, easy to prepare and naturally low glycemic! a) Not too much prep because it is not a day to spend all your time in the kitchen. b) It has to be scrumptious and look like a holiday feast. Start your holiday dinner in the afternoon so at night you're only snacking. c) It cannot cost a fortune! d) Splurge on a great dessert. Before dinner serve a sparkling wine with some good local cheeses and a few different varieties of sliced apples. I know what you’re saying, how can this delicious sounding menu be low glycemic…but it is! 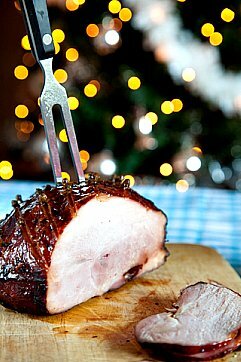 Here is what you do, buy a cooked ham that you will heat on Christmas morning. Get a good grass fed one from a natural foods market. This is the one splurge. No slaving away in the kitchen on Christmas day! This is your treat after spending all of your Thanksgiving morning roasting and wrestling with a turkey. The only dish you need to prepare ahead is the lemon tart. Make it the day before so you can kick back on Christmas. The black beans you soak all night and then simmer for an hour in the morning. This black bean recipe (scroll down for black beans) could not be simpler. And if you really want easy buy some good quality canned black beans like the Eden brand and then add the spices and olive oil. The quinoa cooks quickly. Quinoa is a high protein, low glycemic grain that is very light and goes well with beans and ham. If you have vegetarians with you for dinner they can skip the ham and have enough to eat with the quinoa and beans. The green salad can be arugula or mixed dark leafy greens that you can buy prewashed and organic at any super market or natural foods store. You only need a handful of dried cranberries for color. They are high glycemic but not at this amount. Clementine tangerines add a Christmas touch and you can mix it all together with a good olive oil and lemon dressing. Just blend 6 T. of olive oil to 2 T. of fresh lemon juice, add your favorite seasonings and shake well. Then just add to your salad before serving, 2 T. – 4 T. for a large bowl of salad (8 servings.) Add until all leaves are moistened but the salad is not soggy. There are lots of whole grain dinner rolls on the market so if you can't find sprouted grain just make sure they are wholewheat or some other whole grain. My favorite of these are the sesame millet rolls made by Vital Vittles. But if you can find sprouted grain rolls they have the lowest glycemic index. Alvarado Street Bakery, Ezekiel and Food for Life make sprouted grain rolls. Yes, you may serve these with real butter. The lemon tart is the pièce de résistance; especially yummy and completely low glycemic. Not that we're counting calories on Christmas but it's great to know that you aren't headed for a sugar high with your holiday indulging! And besides it's Christmas and everyone knows that desserts do not count on Christmas, especially when you take a walk after dinner. Can't get outside? Cleaning up the mess is activity enough! The low glycemic plan will ensure that you are thin for life and still able to have your cake and eat it too! Holidays are not meant to be a time of stress and recrimination. Christmas dinner menus should mean that your Christmas is a no stress, joyous event in which you can feel guilt free and celebrate to your heart’s content. No stress, not much prep, no guilt, no blood sugar roller coasters – just a traditional merry Christmas dinner menu! Return from Christmas Dinner Menus to Low Glycemic Recipes. Return from Christmas Dinner Menus to Lifetime Fat Loss home page.